Roger Sedarat: Sa’di and Hafez Substantially Underpins Much of the 19th Century U.S.
With the goal of harnessing the untapped potential of Iranian-Americans, and to build the capacity of the Iranian diaspora in effecting positive change in the U.S. and around the world, the Iranian Americans’ Contributions Project (IACP) has launched a series of interviews that explore the personal and professional backgrounds of prominent Iranian-Americans who have made seminal contributions to their fields of endeavour. We examine lives and journeys that have led to significant achievements in the worlds of science, technology, finance, medicine, law, the arts and numerous other endeavors. Our latest interviewee is Roger Sedarat. 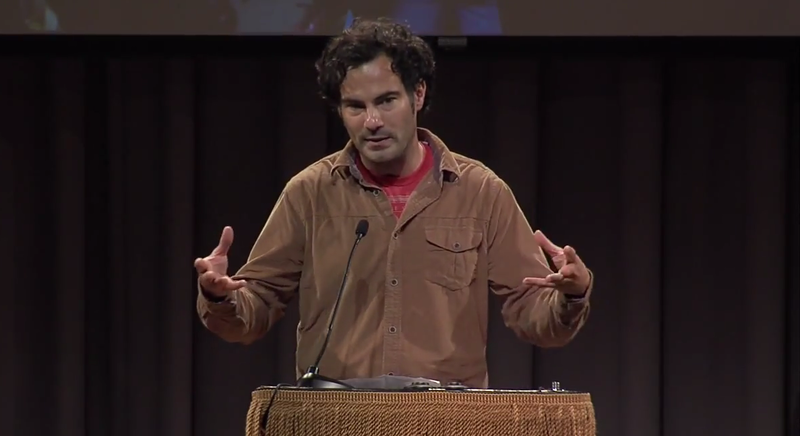 Roger Sedarat is an Iranian-American poet, translator, and scholar. 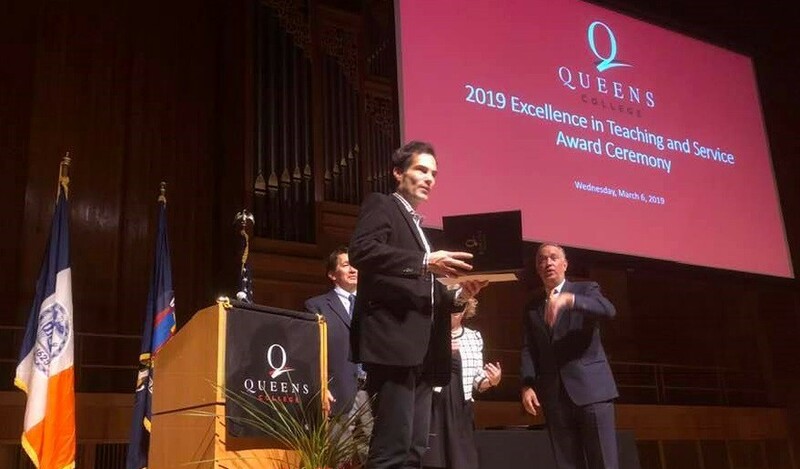 He is an Associate Professor in the English Department at Queens College, City University of New York, ​ where he recently received the 2019 Award for Outstanding Professor. He is the author of four poetry collections: Dear Regime: Letters to the Islamic Republic, which won Ohio UP’s Hollis Summers’ Prize, Ghazal Games, Foot Faults: Tennis Poems, and Haji as Puppet: an Orientalist Burlesque, which won the Word Works’ 2017 Tenth Gate Prize for a Mid-Career Poet. In 2018 he received a large grant from the Atlantic Philanthropies Director/Employee Designated Artist Gift Fund​ to develop his most recent poetry collection, which interrogates the western Orientalist gaze at Iran, for a staged performance. Scheduled for October, 2019 at the Brooklyn School of Music, this show integrates poetry, painting, and music from Iran in the tradition of Persian humor and drama. A recipient of the Willis Barnstone Prize in Translation and co-translator of Nature and Nostalgia in the Poetry of Nader Naderpour, his English renderings of classical and contemporary Persian poetry have appeared in such journals as Poetry, World Literature Today, and Michigan Quarterly Review. Numerous academic articles include studies on both American and Iranian literature. His most recent academic book, Emerson in Iran: the American Appropriation of Persian Poetry, ​offers the first full-length study of Persian influence on the seminal American poet and philosopher, revealing how the verse of Sa’di and Hafez substantially underpins much of the 19th century U.S. literary tradition. I grew up paradoxically both very American and Iranian. My Shirazi father came to the United States with the intention of returning to Iran after completing his education. His plans changed when he met my very American mother, a farm girl from Illinois. While we lived all over the U.S. and ultimately settled in Texas, most Iranian-American families will understand how it’s a lot more complicated than to say that my father, and me for that matter, simply just assimilated here. The Iranian scholar Hamid Dabashi explains it well in one of his books, saying something to the effect that Iran is not so much just the physical location but a figuratively formative relation to a powerful language, culture, etc. Thankfully I grew up in both cultures, Persian and American. Of course it hasn’t been without its complications, but it ultimately became doubly enriching; kind of the best of both worlds. As an artist, even as a human being, it’s opened up so much for me. I’m truly a product of my two loving parents, as well as my two awesome countries. I’m interested in how your family came to the United States, and how you experienced the country as an Iranian immigrant. While I’m a dual national, holding both American and Iranian passports, I’m very much the child of an Iranian immigrant. I used to feel kind of ashamed of that, like I wasn’t authentic enough (whatever that means). As I get older, though, I’m realizing it’s enabled me to see and experience both America and Iran in very privileged ways. Let’s take America first. My Iranian father fell in love with this country (along with my American mother). He raved about its newness and inventiveness. We’d take road trips across the country to see various Iranian relatives, and he’d rhapsodize on the landscape, the history, even the people of the U.S. Not to stereotype too much, but Iranians seem to thrive in America, plugging into a lot of what this country has to offer. I absorbed so much of this from my father, to the point that I pursued a PhD in American literature. As a college student in Illinois in the 1960’s, my father was taken on a field trip with his sociology class. They went to a restaurant chain that was starting to catch on. It was called McDonald’s. Have you heard of that one? (Laughter). He instantly saw the attraction, so he started to invest what little money he and my mother could set aside in the company. That’s how he made his big fortune. Long story short, on family trips in his big Buick he used to make me and my sister salute the golden arches! Conversely, because I grew up in America I looked back to Iran with real interest and wonder. As a kid who was assembling his own books of poetry by the second grade with a hole puncher and a ball of yarn, I was especially interested in the great tradition of Persian poetry. You know the Sufi mystics, how they long for the beloved that informs so much of their existence? That was my relationship to Iran. It’s paradoxical really, that my father looked so much to America as I looked back to his origins…and part of my own. An Iranian-American woman, like me! Can you tell us a little bit about how you met, and how this relationship informs your Iranian identity? We came to find out that both of our fathers were from Shiraz. She asked about my last name, then at work, (later that day I think), she called her father in Shiraz. It turns out our families knew each other! Her eldest uncle went to elementary school with my eldest uncle. After we got married, we went to Shiraz with our first son. I got to see how close my father’s childhood home had been to hers, back when Shiraz was a much smaller city. It’s unbelievable, the connections we share. Like me she also had an American mother, so we had the same complications, along with the same benefits, of a hybrid identity. It’s been an amazing journey of identification with her. We’re 25 years together and I’m still absolutely crazy about her. That great story told in Firdousi’s Shahnameh, “Layla and Majnun,” just about sums us up. (I know she’ll be very embarrassed by this response, which is why I end the question with it). What has been your personal key to success? What were the biggest inspirations for your career? Honestly being the child of an immigrant — an Iranian immigrant — has made perhaps the biggest difference. It’s not like my dad pushed me in the traditional ways, like to make good grades and become a doctor. He gave me a different way of looking at America, its system of free enterprise along with everything else it has to offer. He wasn’t an artist, but he saw and experienced the world like a real eccentric. He wrote and spoke quite originally in English, which is remarkable, since that was his second language. On the other side of things, I inherited my mother’s midwestern work ethic. Growing up on a farm, she was up before dawn doing grown up work all day, cooking big dinners as a young girl for her huge family. I could never take it easy like my Shirazi father, so I have to give my mom (along with my older sister) a lot of credit for my need to produce. Can you share some highlights of your work? Getting a PhD in American literature has both informed and complicated my background in Persian poetry. I ended up fusing traditions. Along with translating Persian ghazals, I started writing original English poems in this form. One critic said of my work, ​”It’s Rumi meets Wallace Stevens.” My last poetry collection, which recently won a prize for mid-career poets in America, plays with Persian stereotypes. Through the persona of “Haji,” (loosely based on the stereotypical 19th century English novel on Iran), I interrogate and expose the western Orientalist gaze. Last year someone who works for a big philanthropic foundation heard me giving a reading and talk about this latest book, and she ended up offering me a rather substantial grant to stage a dramatic production based on the poems. Rather than the typical serious complaints about how much westerners continue to misunderstand Iran and Iranians (and of course they really do), I’m using the best of the Persian tradition that goes all the way back to Hafez to expose hypocrisy with humor and poetry. I’m collaborating with a seasoned veteran who has worked for decades in television at places like Comedy Central. We are staging a great play later this year in Brooklyn, tentatively called, The Haji Show. Our ultimate goal is to have the first ever late night Persian talk show on television. So far it’s shaping up to be something like Stephen Colbert and Larry Sanders meets the old Chappelle Show. But I filter all of that through my incredibly witty and sarcastic relatives. It’s very Iranian, and incredibly funny. Alongside the creative work, there is the academic. Since the 19th century critics have hovered around the Persian influence in the work of the seminal 19th century American writer and philosopher, Ralph Waldo Emerson. Following both my Persian and my American interests, I started looking at Emerson’s writing from both traditions. A real highlight of my work is that I’ve come to write the first full-length book on this subject: Emerson in Iran: The American Appropriation of Persian Poetry. ​Following a visit to Iran, you started looking at the U.S. and Iran through each other’s eyes. Could you share with our readers what misunderstandings both sides have? That’s an especially relevant question right now. Of course there are many Americans who don’t buy into misrepresentations of Iran, but even some educated friends who aren’t that familiar with the country have such crazy ideas about it. I mean they let what one person says or what one movie shows inform their whole perspective. The worst assessments of course are that we are terrorists or that we are all somehow actively disrupting things in the Middle East. But even on the lighter side, a lot of Americans don’t even understand Iran has its own distinct identity, language, and culture (as well as a broad diversity within these categories). Last week my neighbor taking out his trash cans told me, “I’m headed to your country for work next week.” He was going to Doha, Qatar! From the Iranian side, I’m a little more biased, seeing us as a lot more understanding of American people and culture. I think that’s because even friends and relatives I have who have never left Iran grow up speaking English and taking a real interest in other places. That being said, I have noticed the same tendency to make assessments about Americans based on what one politician might say about Muslims in general or Iran in particular. Iranians I know who come to the U.S. and stay for a while express genuine surprise and affection for just how diverse the people are here, both in their backgrounds as well as in their ideologies. There’s obviously not one representative Iran or one Iranian for that matter, and the same goes for America and Americans. What are some of the biggest challenges that you have faced in your career, and what lessons have you learned as a result? What differences and similarities do you see between Iranian and American perceptions of literature? The reception of literature, especially of poetry, is very different between these countries. My wife’s late uncle was an exceptional literary critic as well as a poet back in Iran. When my relatives saw me next to him in Shiraz they freaked out, like I was standing next to Brad Pitt. The country even put him on a stamp! In America, being a poet is very inconsequential. People just don’t care…except other poets. Aside from this cynicism, I’m really intrigued with what crosses over. My wife’s Iranian uncle knew all about Emerson’s interest in Hafez, and even about Emerson’s own writing. There was something spiritual that transcended traditions. Conversely, Americans remain quite interested, even obsessed, with poets like Rumi. Despite problems and misunderstandings in translation, there is something that carries over here too. More than anything my Emerson book shows how despite extreme differences of language and tradition there is a common element that resonates with us all. I think the verse of such poets as Rumi does that too. Can you tell us about your work which earned you the most awards and recognition? My first poetry collection in 2007 that won a national poetry prize got a lot of attention and praise. It was widely reviewed, and it brought me my current dream job of teaching in a very special MFA creative program in New York City. Very few poets back then were writing directly about Iran in America. The book was and remains politically problematic, touching on the revolution and how that affected me and my family. I’ve since written politically about America too, especially with my recent book, so I like to think I’ve balanced things out. Ironically though, it wasn’t so much the content as the tone of that first book that made it matter. I played on all of the great humor in our Persian culture. My late father, like so many of my Iranian relatives, was how we say in Farsi ba-namak ​or “salty”. I brought that dry humor into these poems, sometimes in dark ways. It made the book original, but I was really just riffing on the humor of my Persian culture. I also really messed with rhyme, almost like a rapper. That too came more from Iran, since rhyme has been out of favor in America for a much longer time than in the old country. How can we better grasp the impact of Iranian literature on the American canon? The multicultural trend for some time has been changing the American literary canon. I’m so glad to see Iranian-American literature making a real contribution. The next generation of Iranian-American poets, those 15 or even 20 years younger than me, are already making a dramatic impact. I’m humbled by their incredible work, and jealous of the attention they’re receiving. “Complicate” is a good word to use in your question, since it’s not like they’re always so explicitly Iranian all of the time. Still, their Persian background informs their identity, and therefore their writing, in very significant ways. At the same time, Emerson induced me to us back to the very formation of the American canon. Almost universally critics attribute Ezra Pound’s appropriation of Eastern poetry, from Chinese and Japanese traditions, as basically forming what became modern western poetry in English. Emerson, however, anticipated Pound’s misreading of foreign verse over 50 years earlier, back in the 19th century. His strong interest in Persian poetry, which he accessed through German translations, helped him establish a quintessential American literary tradition. He obsessed over Hafez and Sa’di, to the point of wishing he’d turn into them. He even experimented with taking on their identities. Both of his go-to Persian poets end up informing what esteemed literary critics like Harold Bloom consider the most definitively Emerson, if not American, poems ever written. So Iranian poetry enriched American literature from the beginning. Can you share your thoughts on your Iranian-American identity? What does it mean to be an Iranian-American to you? Being Iranian-American has always given me a kind of special insider/outsider status, meaning I can look at the world and my place in it from two disparate perspectives. That’s come to serve me quite well artistically. At times it’s been a struggle too, fitting in when I don’t feel completely like one or the other, but more and more I see that as an asset. I used to read that hyphen between “Iranian” and “American” as a minus sign, but now it’s there to join two sides of me. I’ve also been blessed to take the best of both worlds. My Iranian-American wife and I really share the Persian value of family. It’s harder to maintain in American society, with everyone so busy and individualistic, but we continue to share meals together as well as host others in our home (to enjoy delicious Persian food!). At the same time, I benefit from a radical American independence, insisting on making my kind of art and living my kind of life.